Having a roof at the proper slope is critical for ensuring that water drains away from your home or outbuilding. Without the appropriate angle, a roof may collect water, which can sit in puddles and cause damage to the shingles or underlying structure. Many outbuildings or porches have flat roofs and are subject to this damage to a far greater extent than are residences. Provided that the flat roof has a slight slope, however, it's usually able to shed any water that accumulates on top. If you have a flat roof shed or flat roof porch, you'll need to be sure it has an adequate pitch or you could find yourself having to conduct frequent roof repairs due to poor drainage. Anything with a slope of some kind will cause water to run off the roof. However, an ideal roof drop per foot should be at least one-eighth to one-quarter of an inch per foot. Anything less than one-eighth of an inch may pool on the roof. Some building codes start at one-quarter of an inch per foot, or two percent. As a general rule of thumb, commercial buildings have a slope of at least one-quarter inch per foot. This means that for every foot of the roof, it must slope downward by at least one-quarter inch. Commercial buildings with a slope like this are considered low slope. In these instances, a system of drains or gutters is necessary to channel the water away from the roof. Drains are usually located at the low points, or valleys, of the roof. Drain systems can be either internal or external. On the other hand, some commercial buildings may be classified as steep slope buildings. These are any buildings with a slope of more than 3 inches per foot. These may still use a drainage system to help rain move away from the roof. The slope of your roof is the angle at which it inclines or declines. If you imagine the top of a building to be the base of a triangle and the peak of the roof to be the triangle's highest point, the slope of the roof is the line that connects them together. The slope is known as the hypotenuse. You can use basic trigonometry to calculate the angle of your roof. 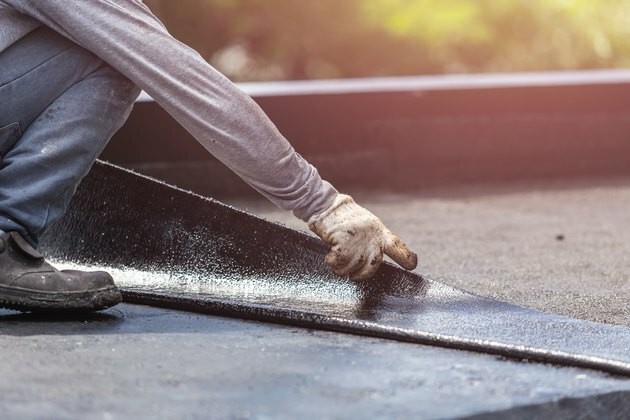 Since most building codes require a pitch of at least one-quarter inch per 12 inches, you should anticipate that the angle of your roof will be at least 4 degrees. If the pitch of your roof is 6 inches per 2 inches, the angle would be 26.5 degrees. A roof that slopes 12 inches for every 12 inches would have a 45-degree angle.